Daniel Kammen couldn’t take it any more, so he quit. An expert in renewable energy, he was appointed by President Obama in 2016 as a science envoy to the State Department. That position was probably a good job under Obama. But when the anti-science, anti-knowledge, fact-averse Trump administration took over, it’s easy to conjecture that he found himself working in an inhospitable environment. Still, he persisted. Until this week. submitted a scathing letter of resignation, specifically citing Donald Trump’s “attacks on the core values of the United States.” He also directly calls out Trump for actions that have “harmed the quality of life in the United States, our standing abroad, and the sustainability of the planet.” Kammen’s full letter of resignation is worth reading, first for its courage and bluntness, and second, for its hidden message, “I-M-P-E-A-C-H,” cleverly embedded as the first letter of each paragraph. Sharply worded protest statements and letters of resignation like this one are becoming a trend for the Trump administration, as frustration and moral outrage grow among government employees, industry leaders and knowledge experts spurned by the know-nothing attitude of this regime. We can only hope that others, staying on to try to contribute their energy and knowledge for the greater good, then finding themselves mired in a hopeless situation, will be as courageous, direct and honest in expressing what has driven them out. 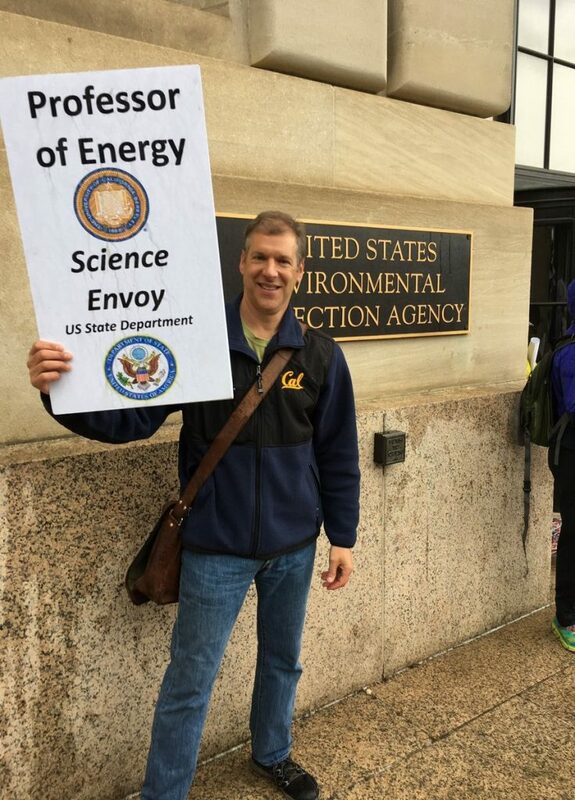 I am resigning from my position as Science Envoy for the Department of State of the United States. Since 1996, I have served the Departments of Energy, the US Environmental Protection Agency, and the state Department in a number of roles. Working closely with the talented teams at State Department Headquarters and at U.S. embassies abroad, we have built significant partnerships in North and East Africa, and in the Middle East, around shared visions of national security, job creation in the U.S. and sustainable energy. My decision to resign is in response to your attacks on core values of the United States. Your failure to condemn white supremacists and neo-Nazis has domestic and international ramifications. On this issue, I stand with the unequivocal and authoritative statements of Charlottesville Mayor Mike Signor, Virginia Governor Terry McAuliffe, Ohio Governor John Kasich, Senator John McCain, Congresswoman Ileana Ros-Lehtenin, Governor Arnold Schwarzenegger, Presidents George H.W. Bush and George W. Bush, Dr. Cornel West, Linda Sarsour, the Palestinian-American activist and one of the organizers of the Women’s March, and many others. Particularly troubling to me is how your response to Charlottesville is consistent with a broader pattern of behavior that enables sexism and racism, and disregards the welfare of all Americans, the global community and the planet. Examples of this destructive pattern have consequences on my duties as Science Envoy. Your decision to abdicate the leadership opportunities and the job creation benefits of the Paris Climate Accord, and to undermine energy and environmental research are not acceptable to me. Acts and words matter. To continue in my role in your administration would be inconsistent with the principles of the United States Oath of Allegiance to which I adhere. Herein, with regret, I resign. I deeply respect and value the work of the many fine people I have encountered in our federal agencies and will miss the opportunity to work with and support them. Your actions to date have, sadly, harmed the quality of life in the United States, our standing abroad, and the sustainability of the planet. Next Post:Houston flood: How much is 9 trillion gallons of water?